Cooler Master’s successor to the infamous CM Storm Scout was released last Fall, so this isn’t a “new” design, but the White “Ghost” edition is new. I had opportunity to modify the original into “Digital Camo” PC for Cooler Master’s booth at Computex. I thought the original Scout design was good, especially the integrated carry handle. My only nag was the window. Users had the option to install two 120 mm cooling fans, but placement of the fans blocked view and limited your choice of CPU coolers. It was a oversight that irritated a lot of people. I noticed immediatelya that Cooler master listened to the feedback and moved the fan locations in the Scout II. Overall, It’s also 1″ bigger than its predecessor, with a more rounded exterior, giving it a more futuristic look. The handle is back with new rubberized grip. The top I/O panel has been upgraded to USB 3.0 for high power charging and lightning fast file transfers, while being protected from dusty environments. 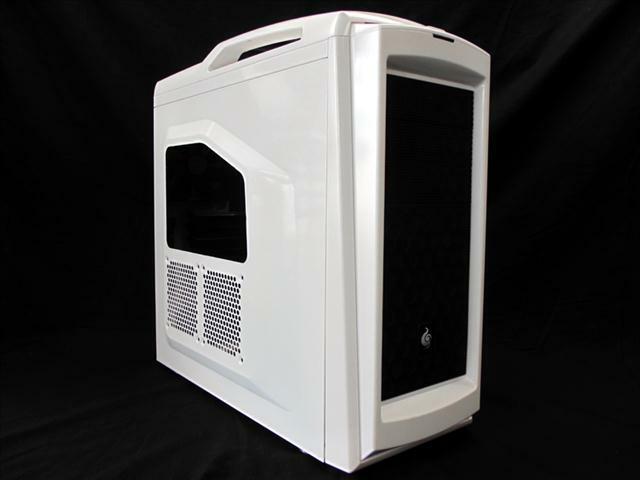 It’s outfitted to fit nine 120 mm case fans, so you can configure the airflow for individual system needs. Cooler Master eliminated two of the 5.25” drives and opted for three, which is more than needed. The HDD cage can now be removed, to support larger video cards like the TITAN, NVIDIA GTX 690 and AMD HD 7990, turning it into a purpose-built Gaming case. The Scout II is a Mid tower that fits ATX and ITX motherboards. Nice review Bill. Lots of good insight. yes! i love your case reviews, Bill. You always take it to the next level. I remember when I was trying to pick a case for my ironman build, and most the other reviews are just glorified box openings. When you talk about options for modding, it’s not just the options they gave, but what you could do if didn’t mind drilling a few holes and what not. hope to see more of these! That lumilor stuff is really cool. Same i like the Theme with the Blue in it. Would look nice with the white. Definitely a great theme choice!!! Startrek could be cool. I liked the idea of a NASA themed build.